Click the button below to add the Perfect Pull Bows EMERALD to your wish list. Simply pull the tie-strings to make a full, beautiful bow. Our Perfect Bows are perfect for all balloon stuffing occasions and wrapping needs. Made from quality, waterproof Flora Satin. When time is crucial and the quantities are large, there is no better way to get a full bow with curling ribbon ties on your stuffed balloon in a matter of seconds. Make a beautiful bow every time, in seconds! Open tails to reveal the tie-strings. 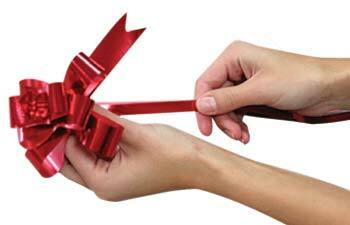 These bows are the perfect size to affix to the top of any Gift in a balloon. THIS IS .. A MUST TO ADD TO YOUR STUFFED BALLOON! Available in 2 sizes: 5 inch and 8 inch. The Berwick Perfect Pull Bows are packed each or 50 in a box, they are individually wrapped in a cello sleeve making them convenient to store and easy to use. You can order 1 or as many as you need. 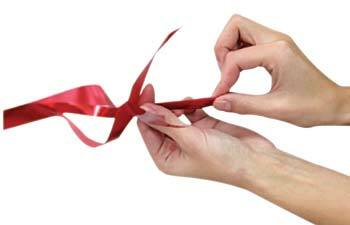 You might want to add Mylar shred and curling ribbon to complete your color scheme for your gift in a balloon. Always keep this one in your inventory , it goes with many seasons and occasions.